Since the launch of WatchKit in November 2014, I have been doing research and development for the Apple Watch. In this post, I’ll be offering some insight based on my experience building an app using the WatchKit SDK. We will cover the structure of a Watch application, information about interfacing, and a method of connecting a Watch App to its iOS counterpart. A Watch app split into two parts: a WatchKit App containing the storyboard and resources which is installed on the Watch device, and a WatchKit Extension containing all of the code and other supporting files. With this configuration, when an app is launched on the Watch, the Watchkit Extension runs on the iPhone in the background. The WatchKit App and the WatchKit Extension work hand-in-hand and function as a single app for the Watch. Watch apps exist as children of regular iPhone apps. A Watch app is intended to complement its iPhone counterpart and they both will exist as a part of the same Xcode project. Despite this, the WatchKit and iPhone apps run independently of each other. In order to send data from the Apple Watch to the iPhone, we need a way of communicating from the Watch app to the iPhone app. Managing layouts for views with WatchKit is done in a way that is familiar to iOS developers, using a storyboard and controllers. 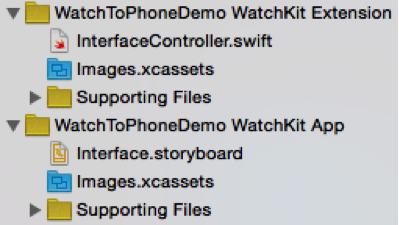 Watch Apps contain a storyboard file called “Interface” and the WatchKit Extension contains WKInterfaceController classes. 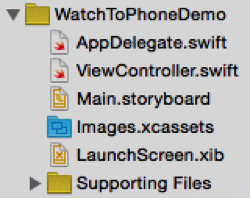 These files work as WatchKit’s version of the Main.storyboard and UIViewController classes for iOS. 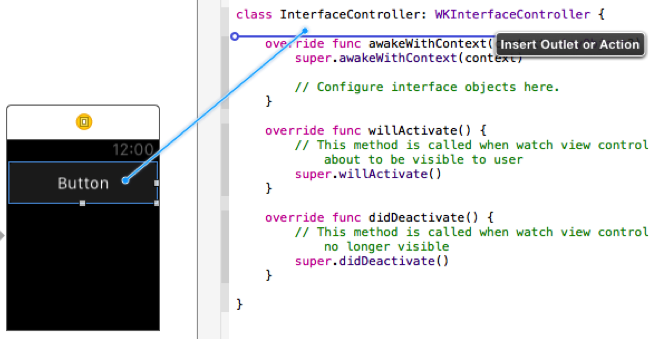 WatchKit Interface Controllers work very similarly to View Controllers – for example, they can have bound IBOutlets and IBActions for objects in the storyboard. The main difference lies within the interface layouts in the storyboards. When interface objects such as Tables, Buttons, or Labels are dragged into an interface layout, instead of being placed wherever it was dragged to and defaulting to no constraints, the object will snap into place filling the width of the layout with a fixed height. With some experimentation, I quickly learned that there isn’t much versatility in the layout design. In my time messing around in Xcode, I found that each element of my layouts needs to be adequately spaced to be easily readable by the user. WatchKit’s storyboard seems to encourage developers to abide by Apple’s guidelines for Watch Apps, which emphasize that these layouts should be made to be simplistic and readable. Also mentioned in Apple’s guidelines are the navigation schemes that interfaces must follow: Page based or Hierarchical. Read more information about this on the Apple Watch Programming Guide. As a part of my research and development, I’ve been working on an app for the popular social website, reddit, which essentially involves showing a feed of information on the Watch. Over the course of developing this app, I discovered how the pairing of the iPhone and the Apple Watch has the potential to be useful. In this case, tapping on a button on the Watch app will open the link on the iPhone, where you can interact on a larger screen and take many more actions. 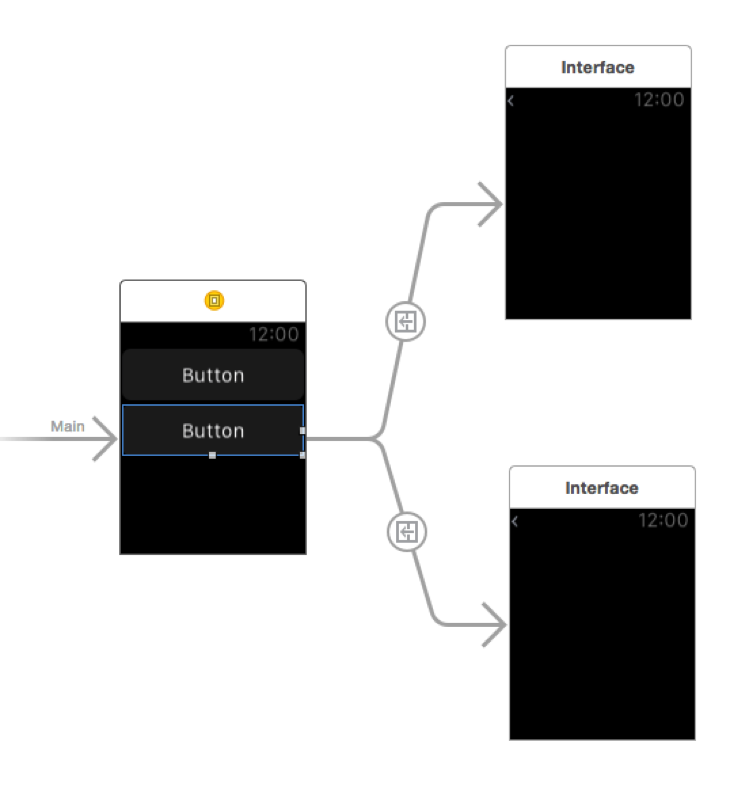 To make a simple demo of this functionality, place a button on the WatchKit interface and a label on the iOS app’s storyboard. Now, hook up the button to the WatchKit Interface Controller as an IBAction in order to respond to button tap events. Also hook up the Label to the UI View Controller as an IBOutlet. In the Interface Controller, we make up a string variable to send to the label. To run this demo, be sure to first build both the iOS and Watch Apps. 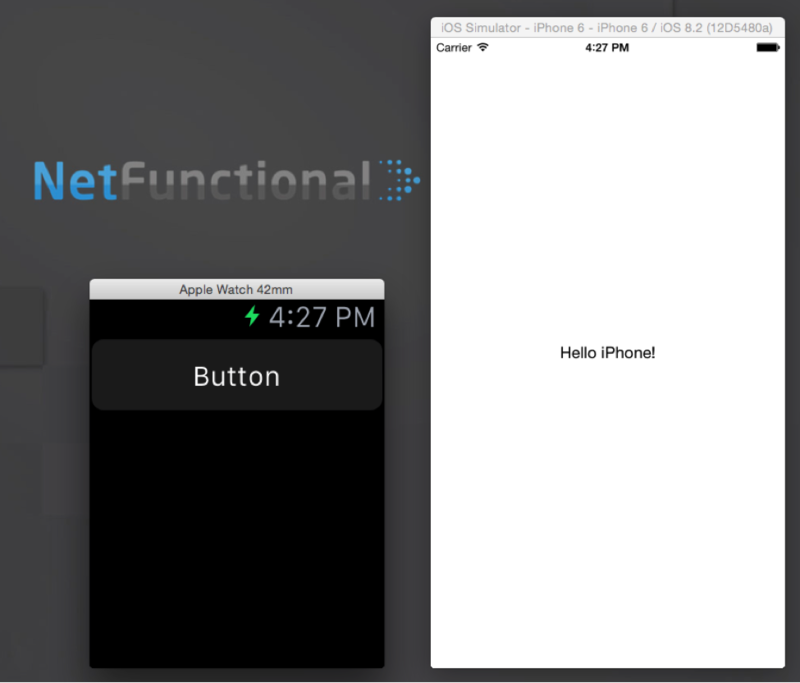 Run the Watch app from Xcode and launch the iOS app from the iOS Simulator. Tap the button on the Watch to see the text on the label update on the iPhone. See example code on GitHub. Ultimately, while the pairing of the iPhone and the Apple Watch highlights the idea that the Apple Watch is a mere “second display” for the iPhone, in actuality, it can pose benefits to users. People will tend to use their Apple Watch to quickly check on information that is immediately relevant like notifications or weather. If more action is required from the user to browse as site, for example, it may be beneficial to refer the user to the parent iPhone app from the Watch, as demonstrated in this guide. We recently open sourced the nf_snmp Titanium module, and have released the code on Github. As part of app marketing and release processes, we frequently use Apples iTunes promo codes or redemption codes – the seemingly random string of characters issued by the iTunes store. Matthew White has written a quick and to the point article on enabling SNMP on ESXi – you can read it on his blog. Our SNMP Scan App searches for SNMP enabled devices. This usually finds printers, home routers and other networked devices. By default, however, Cisco IOS devices won’t be found, and can’t be graphed. This is because Cisco IOS disables SNMP by default. Here’s to safely enable it. Login to your router, switch or access point. Enable SNMP – pick your community name. In our example, we’ll use ‘netfunctional’ as the community name. This lets any device which matches Access List 30 talk to our Cisco device using the SNMP community ‘netfunctional’. Note that these instructions will likely work for Juniper, Foundry Networks and other devices which use Cisco IOS-like syntax for configuration. For more information, see Cisco’s Cisco IOS Configuration – SNMP Chapter. Enter the number of codes you wish to generate. Only request what you need since there is a 50 limit for every release of the app. Note: Codes only last for 4 weeks (28 days) so don’t just request all 50 at once. © 2019 NetFunctional Inc.. All Rights Reserved.